We believe in small town America. where locally owned and operated begins. Explore and enjoy a full coffee bar and made-from-scratch sandwiches, soups, and sweets. 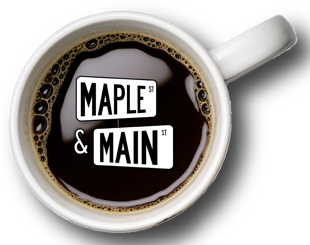 Stop in, take a break, and be part of a community... at the corner of Maple & Main. 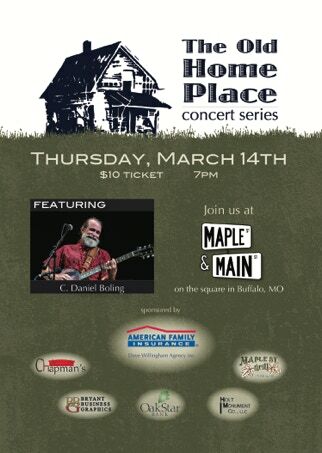 Award winning songwriter Daniel Boling shares experiences from a life well-lived in places as far-ranging as Okinawa, Japan, and Padre Island, Texas. Born into a traveling Air Force family, Boling worked as a National Park Ranger and a Criminal Investigator for the US Bureau of Land Management for 30 years. At 50, he started touring full-time, bringing his beautiful story songs, finger style guitar , and friendly tenor voice to delighted audiences across the U.S., Western Europe, New Zealand and Australia.